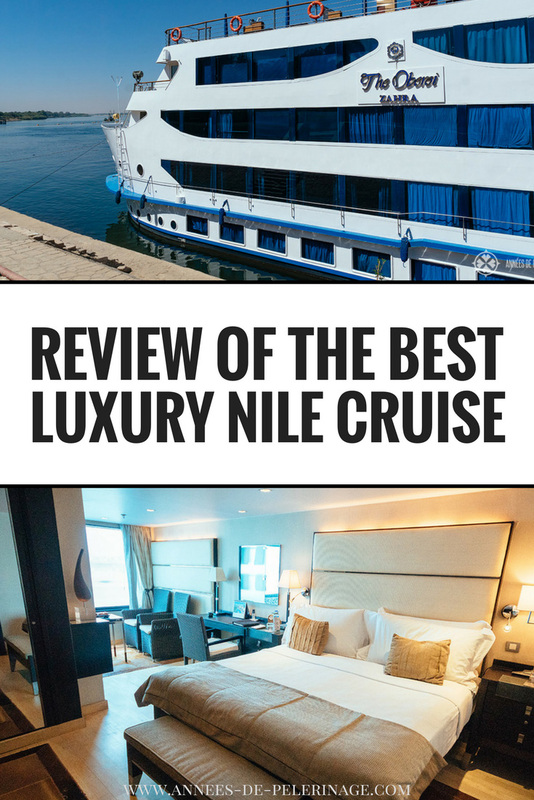 An authentic & detailed review of the Oberoi Zahra luxury Nile Cruise from my visit in 2018. 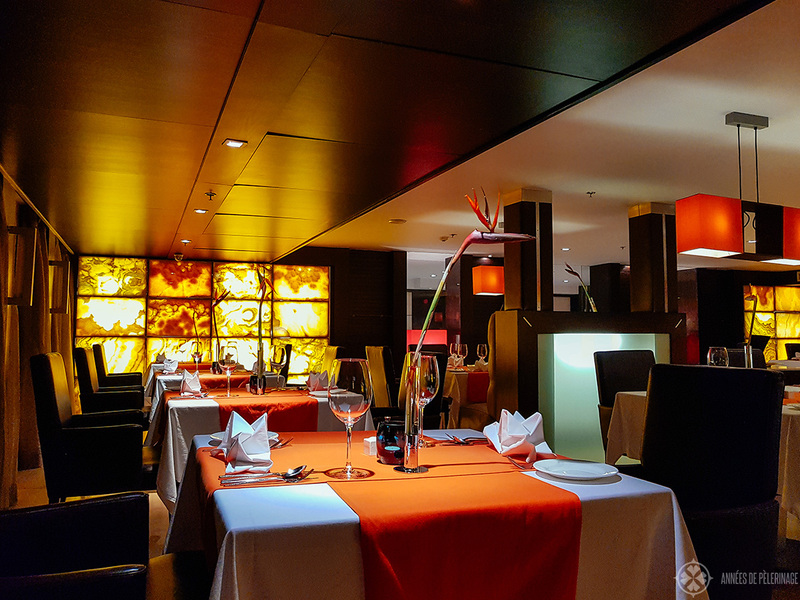 So, you are looking for an Oberoi Zahra review? And maybe you are now wondering if the ship is really that good and if a luxury Nile cruise is worth it? Then you are not alone! Before my first trip to Egypt (read all about the 20 best things I visited), I was in the same boat (sorry for the bad pun!). 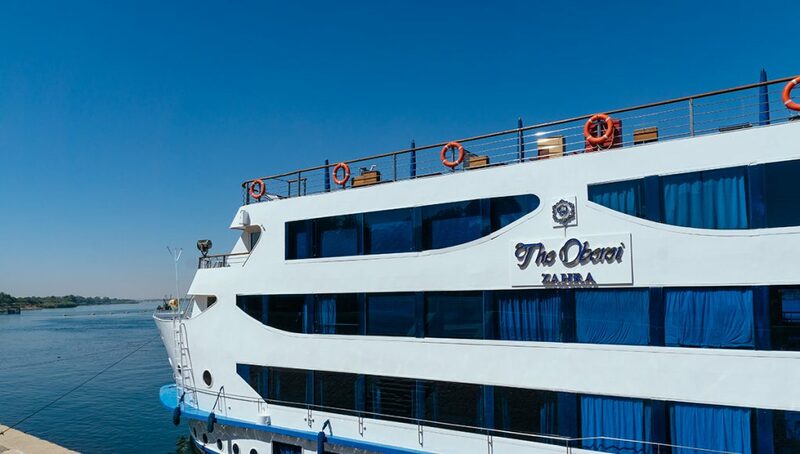 The Oberoi Zahra is certainly a beautiful ship, it is often ranked as the best Nile cruise ship in Egypt, but it does come with a big price tag (click here to check out prices). With a little bit of research, you’d find a 5-day Nile cruise for a tenth of the price you’d have to pay for the flagship of the small Oberoi fleet. This is why I compiled a detailed review of the Oberoi Zahra for you. Much as I love to see the perfect pictures on the websites and social media channels of Oberoi, I focused on providing authentic pictures and an honest review for you. So, let’s dive right into it, eh? Note: This is a non-sponsored review. I had no association with Oberoi at all and paid for the 7-day cruise in a luxury room myself. I do earn a small commission from purchases through the links in this article. The Oberoi Zahra is a spacious boat. Incredibly spacious for such a small river boat. 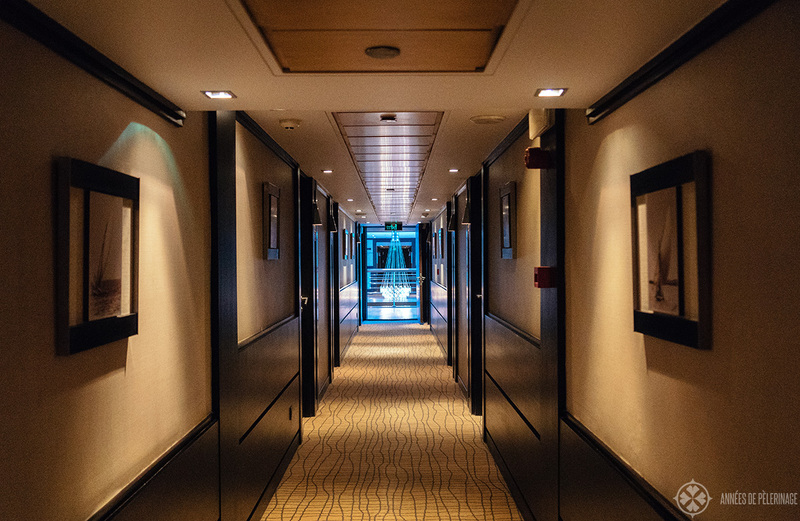 Upon entering the two-tiered lobby of the boat, you cannot stop but marvel at all that space. Benches, seating groups, and wide open windows – it’s truly glorious. Stainless-steel, white Carrara marble and fine leathers everywhere you look, with a design classic sprinkled in here and there. There are only 27 suites and cabins on the Zahra. 27!! 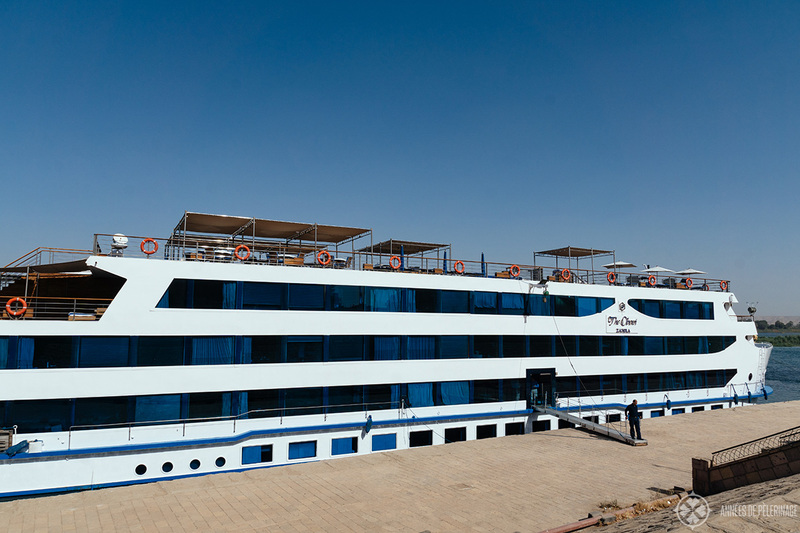 Mövenpick, which has one of the largest fleets on the Nile, typically fits about 60 to 70 cabins into their boats. On the Oberoi Zahra, that space is used for a bar, a cinema, a library, a smoking lounge, a spa, a gym, a gaming area and even a hairdresser saloon! I am a very visual guy, and interior design is important to me. I feel this is where the Oberoi Zahra truly excels. 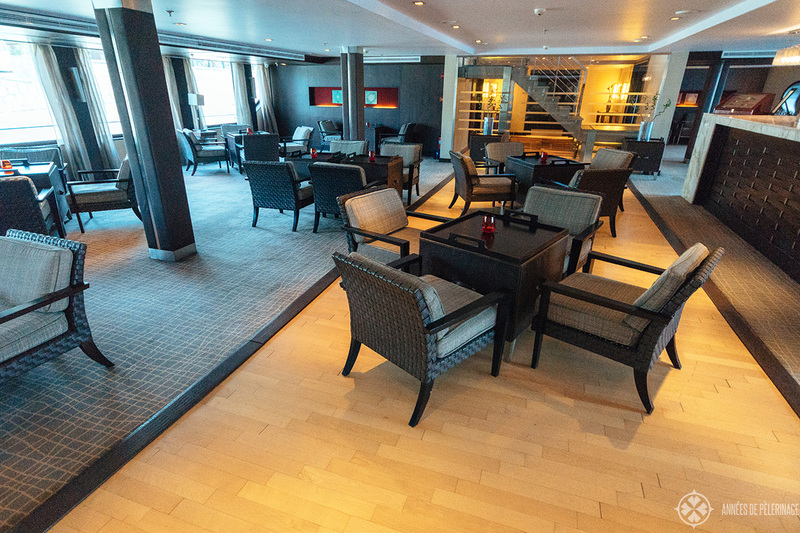 I’ve been on a couple of luxury cruise ships and usually even on these super exclusive ships the furniture is a compromise between beauty and the necessities (& dangers) of the wide open sea. As the chances of running into a tempest on the Nile are exceedingly slim (we did experience a sandstorm tho! ), everything feels pretty much like in a design hotel. I loved it! With that much space and so little guests, the ship is also incredibly quiet. It never feels crowded, you rarely run into anyone and even the sun deck is an oasis of quiet. 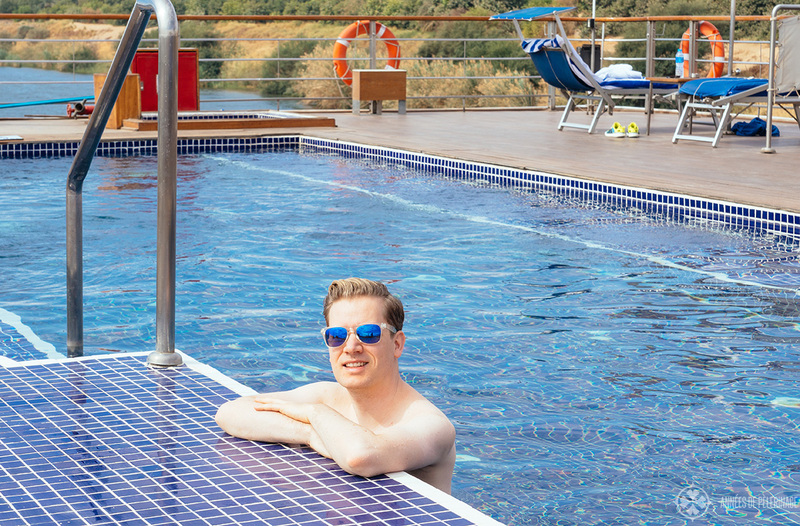 As I never was a guy for socializing, I felt this was incredible and exactly what I wanted – combining the wonders of ancient Egypt with a bit of relaxation. And in case you are wondering: There are elevators around the boat and everything is perfectly fit for physically-challenged guest, as they put it on the website. In our tour group, there was a guy who recently had a knee surgery and they did everything in their power to accommodate him. I actually couldn’t find any information on its delivery date, but everything still felt quite pristine and it excellent shape. I’d guess it would be around 2008. The whole ship is well air-conditioned and filters all its water, adding extra safety for your spoilt western tummy. 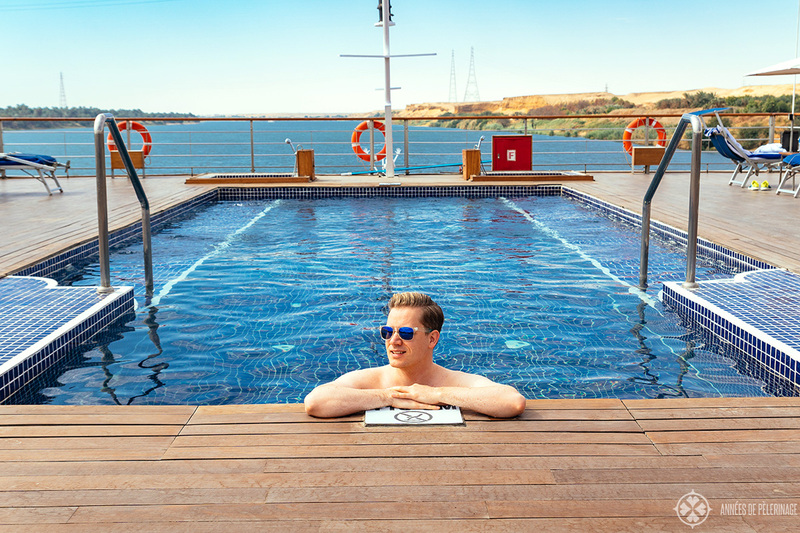 The only thing you might want to criticize is the slow wifi, but obviously, that is a bit of a problem on the Nile & in Egypt – just like on any other cruise ship. It does say “high-speed wifi on their website”, though. It’s not. 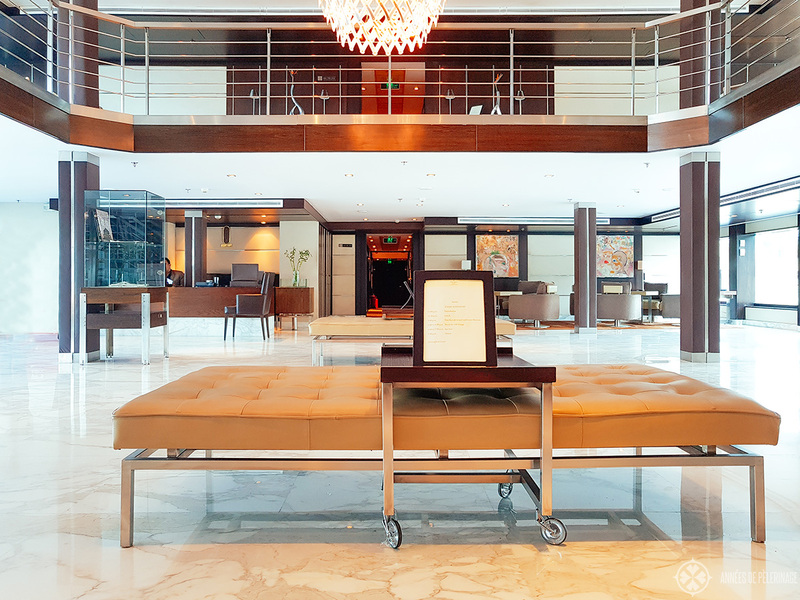 Much like the lobby, the cabins on the Oberoi Zahra are spacious and beautiful. 26,5 m² (284 square feet) for the standard luxury cabin. 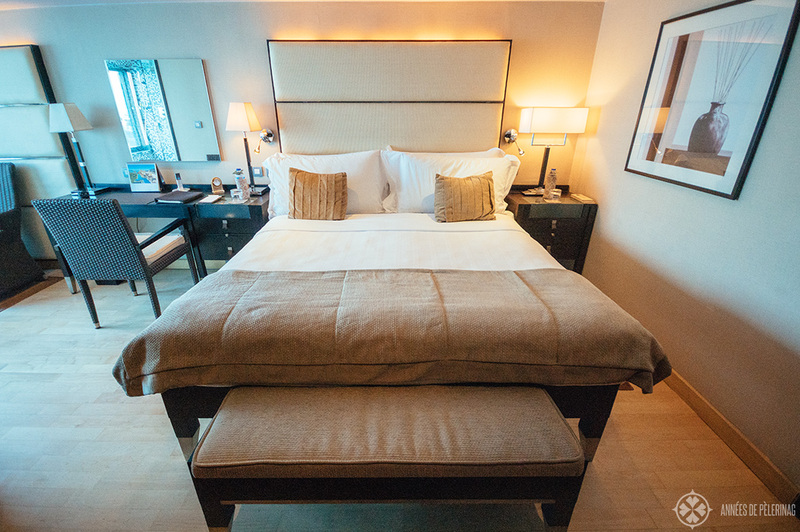 A full king size bed with a beautiful headboard easily fits in and there is a lot of space to store your luggage (can be split into two single beds, if needed). There is a writing desk and even a sitting area to enjoy the view out of the huge panoramic window (can be opened!). While I personally never watch TV, there is a big one for those looking for some visual entertainment as well. The whole interior of the cabin is not only beautiful but quite practical & efficient and so incredibly light. 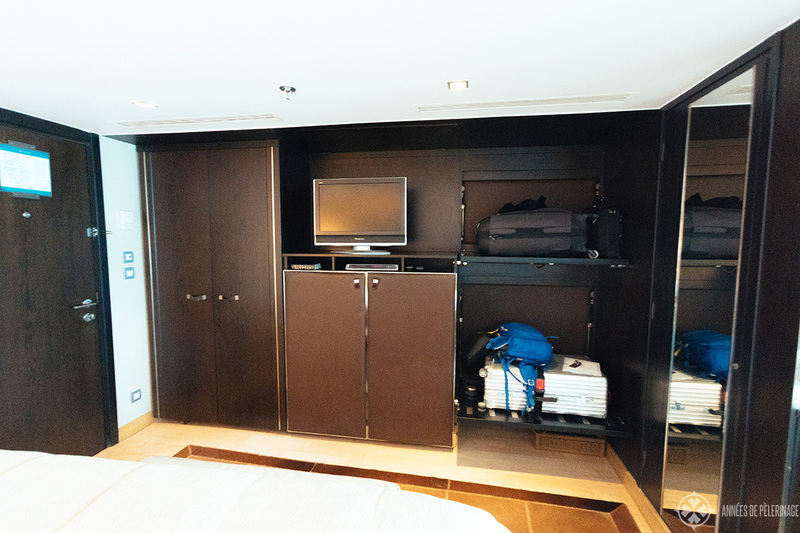 I had no problem fitting my luggage into the storage unit (make sure to read my guide on what to wear in Egypt). The mattresses where considerably hard, though, and they could have cleaned the panoramic windows before our arrival. The bathroom truly is fantastic. 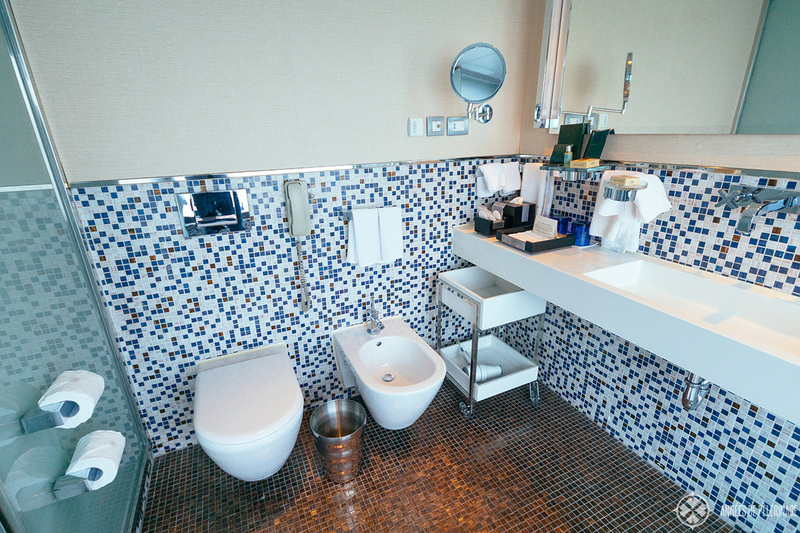 It’s the largest bathroom I ever had on a cruise ship. If not for the huge panoramic window (no worries there are electronic blinds!) you’d almost couldn’t believe you are on a ship. It’s so well appointed, but only has a shower and no bathtub. Oh, and L’Occitane is their choice for shampoos, body lotion, and soaps! Sadly, the Zahra is quite a loud boat, as almost all riverboats are. The motor is constantly droning on and I’d actually recommend bringing earplugs if you got a light sleep (my cabin was on the second floor, close to the rear). Especially as they do have private docks, there are no nights on the river (just some early departures), they could have connected to a power source on land. But either the Zahra is not equipped for it or nobody thought of it. 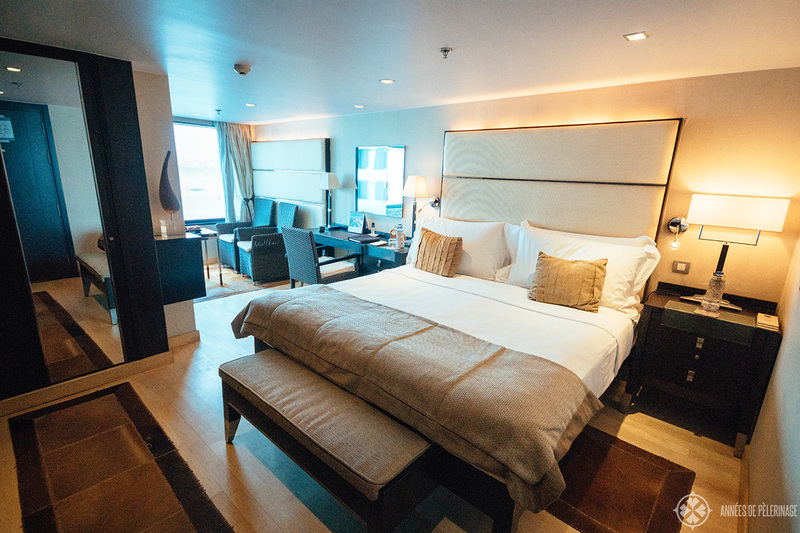 There are also two luxury suites on board the Oberoi Zahra (538 square feet / 50 m²). I didn’t get a chance to review them in person as they were booked out. In hindsight, I do not regret booking a standard (or rather not so standard) luxury cabin. The suites do have their own private jacuzzi but guests on the upper sun deck would still be able to see parts of your private sun deck. 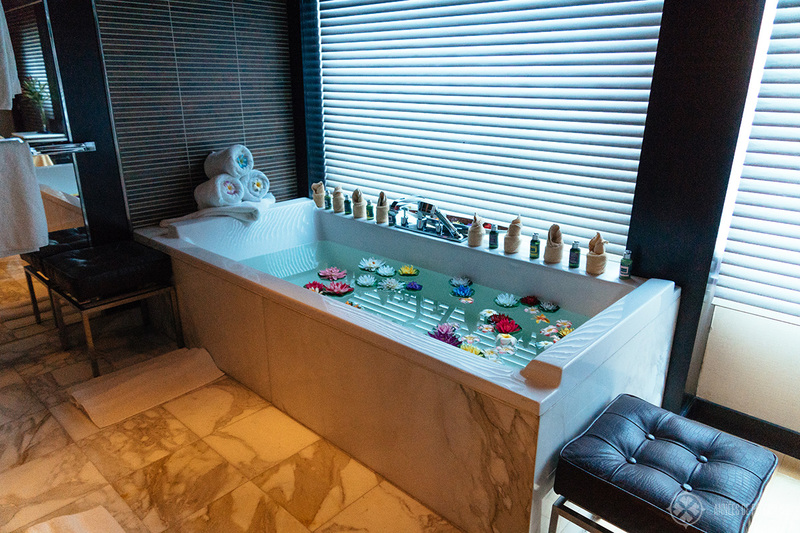 That being said – I would have loved to relax in that huge bathtub instead of just having a shower. The whole upper deck is one big sun deck. It’s separated into a bar & restaurant area, and a pool & relaxing area. The pool is huge but was a bit too cold for my tastes. The sun loungers are well spaced and separated by additional canvas blinds for some extra privacy. The parasols could have been a bit bigger, as two sun loungers barely fit under one (the Egyptian sun is intense!! ), but maybe that’s just me and my paranoia of getting a sunburn. An additional jacuzzi would have been a lovely addition to the whole ensemble. Sadly, we were not allowed to eat lunch on the deck and the overall service on deck was pretty poor. Ordering drinks usually took around 20 minutes and there was nobody who prepared your sun loungers for you (at least not without asking), brought you new towels – but maybe that was due to the fact there usually was just one service guy. There is also a spa onboard the Oberoi Zahra with two ladies from Thailand in charge of all the massages and treatments. I booked one Balinese massage and was quite satisfied with it. Prices were extraordinarily competitive (like 40 US-Dollar or so) for a 60minutes massage that lasted 90 minutes in the end. I couldn’t say the whole experience was top-notch but for a spa on such a small cruise ship, they really tried their best. I probably wouldn’t book a facial treatment, but a massage is just what I needed after all the sightseeing. 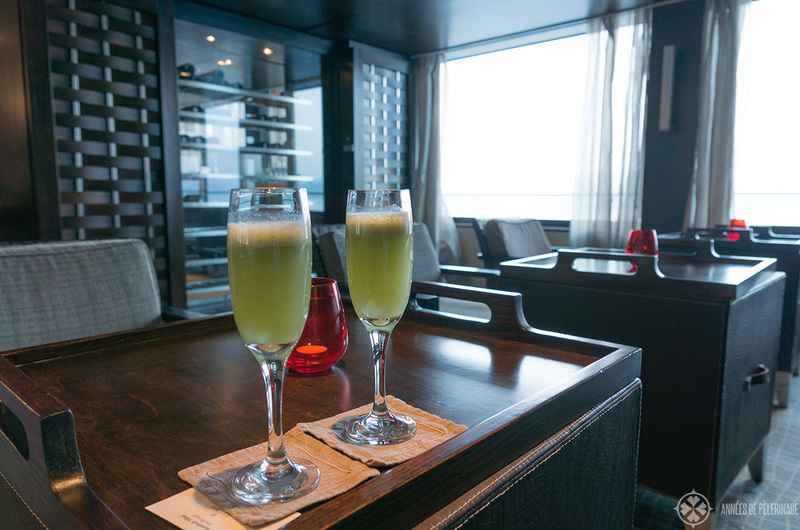 The excursions on the Oberoi Zahra were really exceeding my expectations in every way. At the end of the day, it was the very reason I booked this boat and didn’t stay at hotels instead. First of all, we had our own Egyptologist. 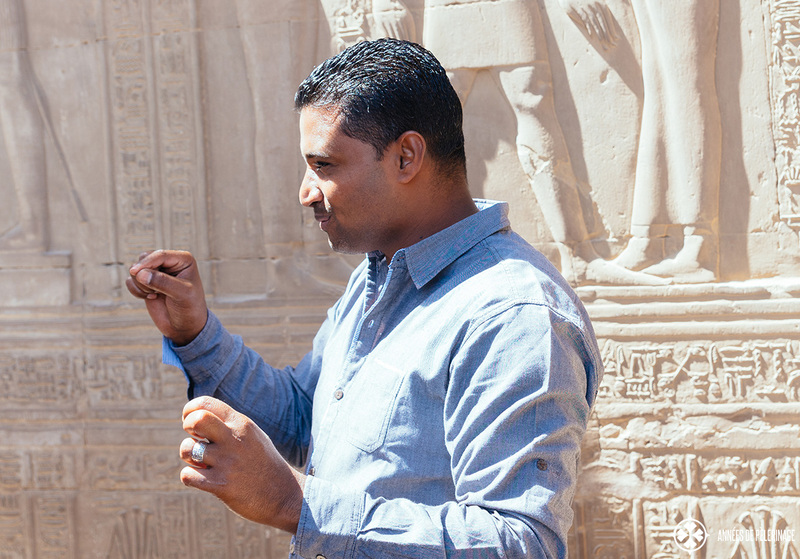 Not a casual tour guide, but somebody who studied at the University in Cairo and was fluent in old Egyptian. There was not a single question he could not answer (and I am a very inquisitive person). He also was fluent in German (as I am a German native speaker). They’ll provide you with a guide fluent in whatever language you want. Groups are never larger than 6 persons. So, don’t be afraid to be stuck down in a huge group running behind a raised umbrella. Secondly, the Oberoi Zahra has probably the most extensive itinerary of all the Nile cruise ships. 7-days is a long time and you are visiting temples like Habu, Edfu or Kom Ombo, which are not on many other lists. What I loved the most that, full as the itinerary of the Oberoi Zahra sounds, it was well spaced (except for the second day). So, you’d have a two or three-hour excursion in the morning (9 am until 12 am). Then you came back to the boat (private minivans! ), were able to enjoy lunch, relax a bit in your cabin or on the sun deck and had another excursion in the afternoon (say 3 pm till 5 pm). It was never stressful and always perfectly relaxed. I also had the impression that the timing of all the tours was perfect. 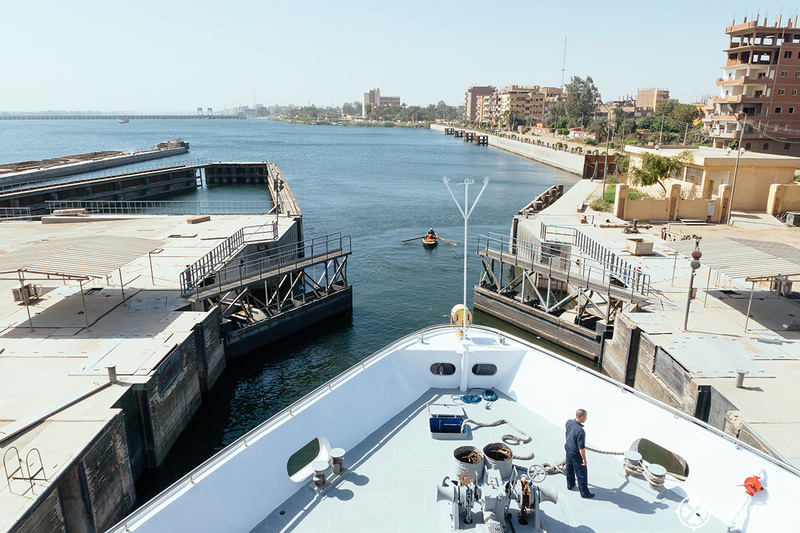 The ship repositioned quite a lot in the area around Luxor – all to allow the groups to enter the highlights during the quietest times of the day. If you are worried about the general travel safety in Egypt, read this guide. The short answer: you couldn’t be in better hands than with Oberoi. Note: While there is a service charge for the cruise ship, it did not cover the drivers and the Egyptologist. Personally speaking, I’d have preferred if the cruise was 100 US-Dollar more expensive and they’d settle it the official way. But I guess that’s just the Egyptian way. I have mixed feelings about the food onboard the Oberoi Zahra. Three multi-course meals a day were included in the room fee. So, let me be clear: None of the meals failed my taste buds and there was not a single wish the cooks weren’t able to accommodate. It was no Michelin-star quality, but more like a good restaurant, you’d recommend friends. But at the same time, my Oberoi Zahra review would not be complete without mentioning there was not a single night with traditional Egyptian food (we had to specifically arrange that). There was just one Indian night I felt they could have skipped. 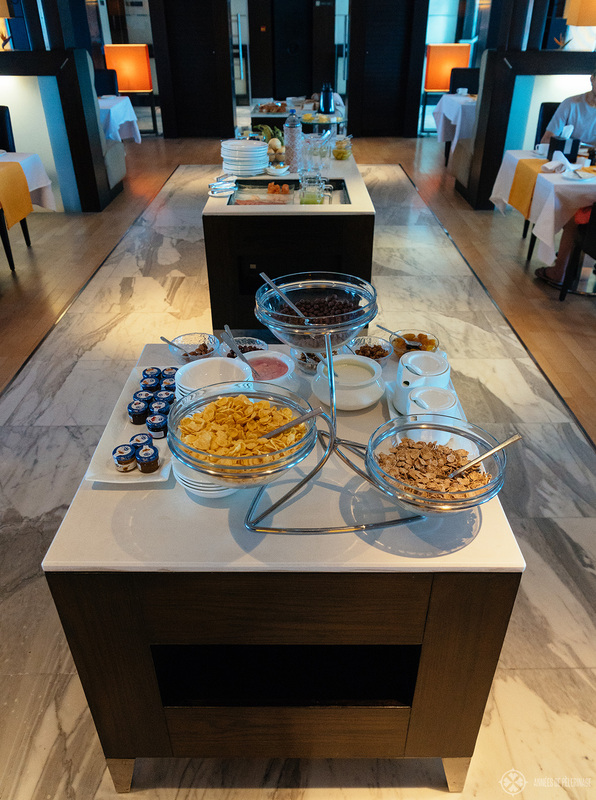 Breakfast was a mixture between a small buffet & à la carte (quite a smart choice in hot countries!) – again without traditional Egyptian specialties. I would have expected a mixture, so guests would have the opportunity to get intimate with that side of the wonderful Egyptian culture as well. There was also one Cocktail Night. Sadly, we were only invited to wine or soda and cocktails were not included. Which felt extremely strange – the keyboard player searching for the auto-tune button wasn’t exactly a highlight of that particular evening either. 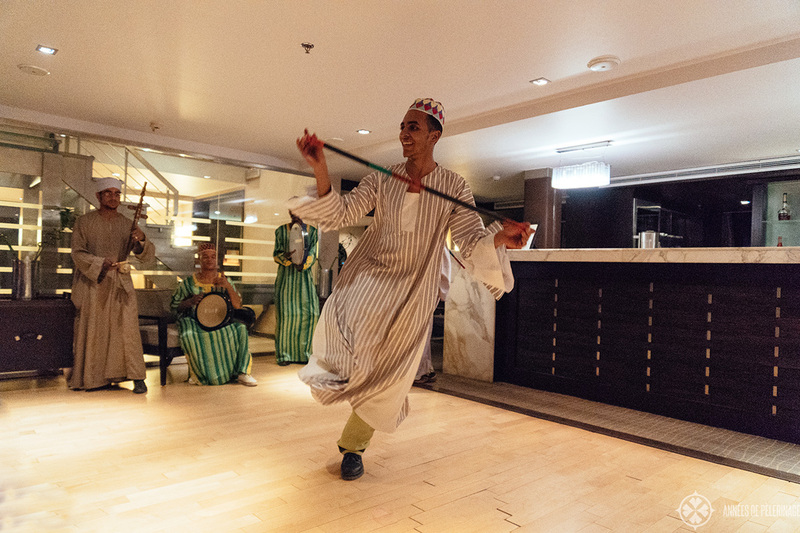 There was one Nubian night with a traditional Nubian dance and music show. It was actually quite enjoyable, but again I did miss some Nubian specialities to go along with the show. If you are wondering about the dress code on the Oberoi Zahra. There really isn’t one, as long as you dress smart, but really no need to bring a suit/tuxedo. Shirts, trousers and closed shoes are totally fine. If there’s one other thing I’d have to criticize about the Oberoi Zahra then it would be the overall service. It’s not like they did a terrible job. Everyone did his best to fulfill all my wishes & was always beyond friendly. But it was nowhere close to what you would experience in any other luxury hotel around the world. For me, true luxury starts when my wishes are anticipated, when they know me better than I do. When there are all these little things that turn a great experience into an exceptional adventure exceeding all your expectations. That’s exactly what you get in all the Oberois in India – but not here in Egypt. So, what do I mean: After an excursion, I’d expect a little welcome drink or maybe some chocolates waiting for me in my room. I’d expect a little trinket to remember my stay waiting for me on the last day and I’d expect those needless luxuries like a complimentary bookmark resting on my book on the night table or a little cloth to clean my sunglasses because the room boy saw they are dirty. I’d expect a sherbet brought to me while relaxing on the sun deck. I’d expect the waiters to know my name (only 27 cabins!!) and my preferences on the second day. Funnily enough, I had a talk with the manager on this topic. Even on the last day, the waiters would continue to ask me “sparkling or still water?”. He had the opinion that guests might change their drinking habits. Fair enough (if unlikely), but then you could add a “Still water again for you, [insert name]?”. Mind you, just one episode! Now you might say Norman, isn’t that a bit too harsh? If you pay so much money (~7000 US-Dollar for a week) you expect above stellar service and not just good service. You expect the room boy to clean the last spot of dust or cobweb and not use his time to produce towel sculptures. That being said, it’s my honest opinion that the service on the Oberoi Zahra is still ways above any other cruise ship between Luxor and Aswan. They managed to bring standard 5-star service on the Nile. In Egypt where the internationally experienced staff is probably quite hard to source, that is no small feat. Still, I’d send the manager on a trip to Paris, London or Tokyo to understand what is possible in terms of luxury service. I do not regret booking the 7-day Nile cruise on the Oberoi Zahra – not for a second. It was utterly what I expected, the boat is truly beautiful and the excursions were some of the best I ever had. 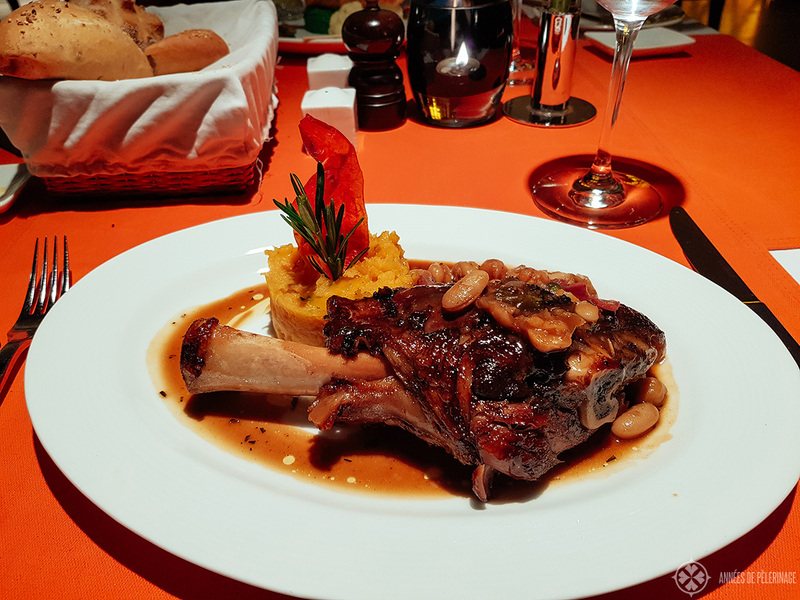 While there is still a lot to be improved in terms of food & service, I highly doubt you’d find any better in Egypt – neither on the Nile or in the luxury hotels in Luxor or Aswan. Actually, I’d go as far as saying: Money permitting, you’d be downright stupid to book another option to explore the wonders of ancient Thebes. There simply is no more luxurious and relaxing way to do so. Naturally, you could also book 3 nights at the famous Cataract Hotel in Aswan (check prices & pictures here) and 4 nights in the Winter Palace in Luxor (check prices & pictures here) and use them as a home base to see explore the wonders on your own. You see, the Oberoi Zahra only covers about 200 kilometers in those 7 days. But I highly doubt the experience will be better, I don’t think it will be cheaper and it certainly won’t be more relaxing. 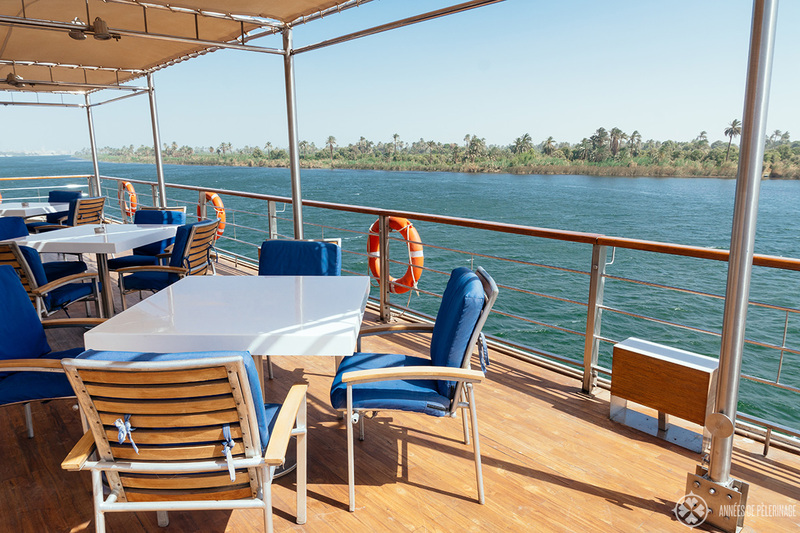 5-day or 7-day Nile cruise? Which is better? 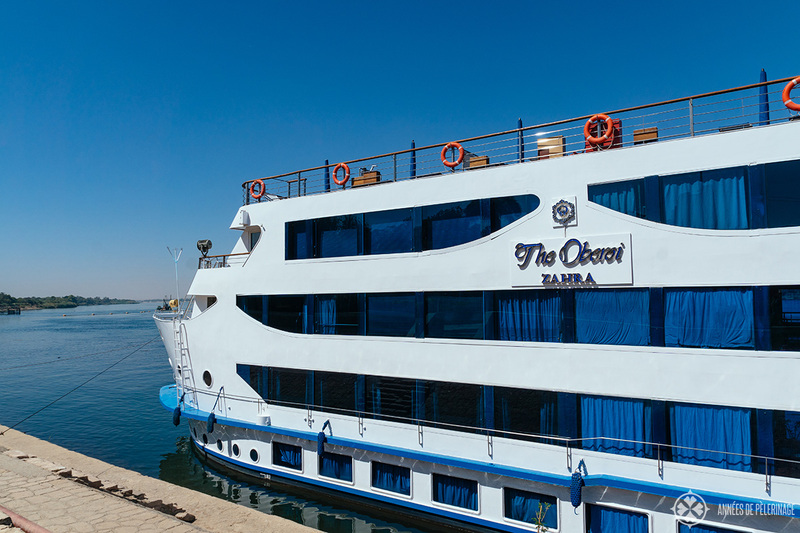 The Oberoi Zahra starts from Luxor and from Aswan, and it really doesn’t matter which route you take in terms of sightseeing. If you want to move on to Hurghada, I’d recommend ending your cruise in Luxor as it will be considerably faster to reach the Red Sea from there. 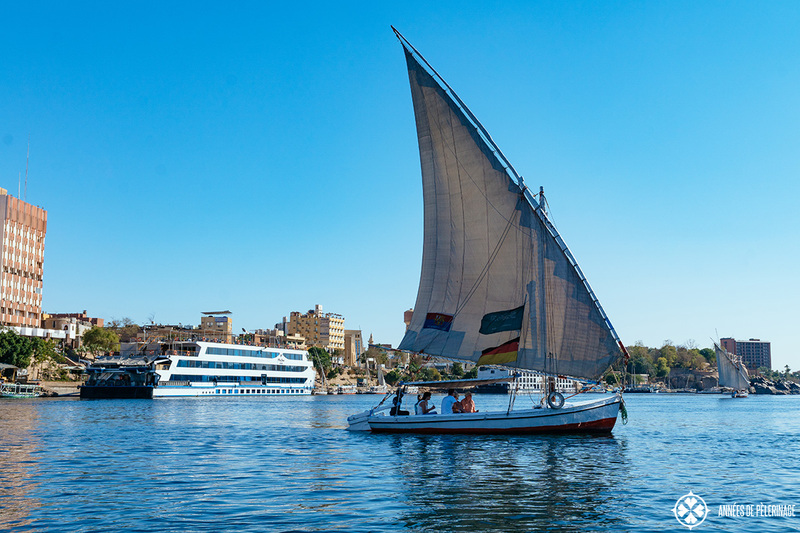 That being said, you can choose between a 5-day and a 7-day Nile cruise on the Oberoi Zahra. There is not much of a difference really and if you are short on time you won’t miss much on the last 2 days. 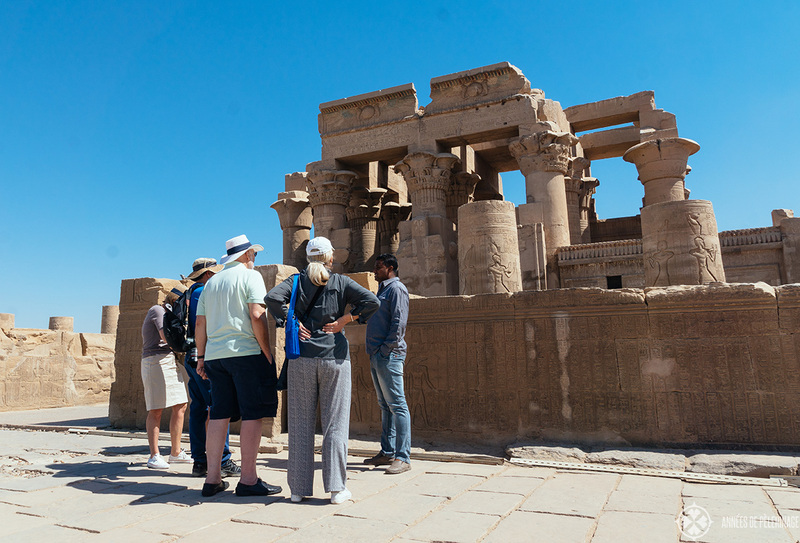 You won’t be visiting the Kom Ombo Crocodile temple, you’d miss the sound and light show at the Philae temple and the visit to the Botanical Garden. While they are all quite nice, they are not as spectacular as the rest. I picked the 7-day Nile cruise because those last two days are quite relaxing and I really wanted to see Abu Simbel. 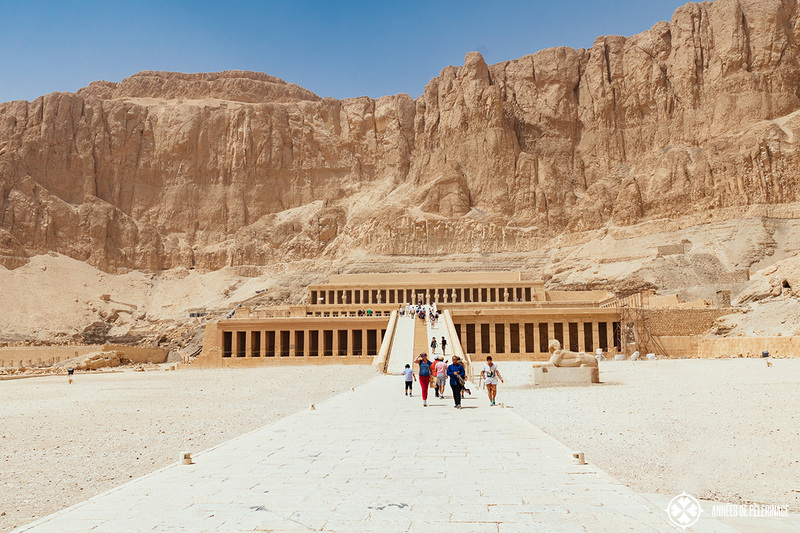 In theory, you could check out on the 5th day and take a hotel in Luxor and visit Abu Simbel on your own (click to read about your options). I chose the relaxing and less stressful alternative and let Oberoi organize the trip and book the plane tickets for me. 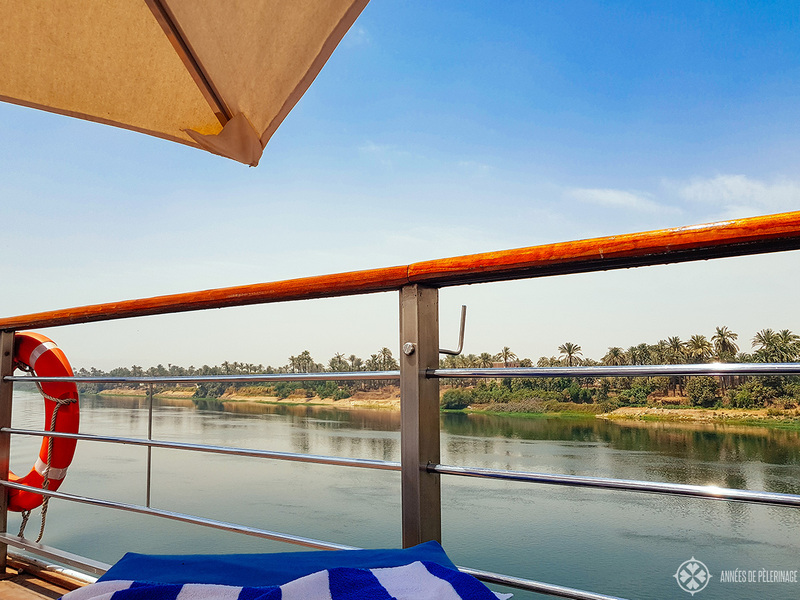 Last but not least, I’d like to lose a word or two about the other Oberoi cruise ship on the Nile: The Oberoi Philae (click here for recent prices & pictures) and why I didn’t pick that one. The itinerary on the Zahra is a bit richer. So, you’ll see a bit more on the West Bank and you got that optional visit to Abu Simbel, as well as the possibility to see the botanical garden in Aswan. So, for those interested in sightseeing, the Zahra is probably the better choice. When it comes to comparing the Oberoi Zahra vs Philae, it should be noted that the latter is the older ship but shares, more or less, the same design. As the itinerary is a bit shorter, the room prices are a bit cheaper and there are three types of rooms (luxury cabin, luxury suite and a luxury suite with private terrace) instead of just two categories on the Oberoi Philae. Overall, there really isn’t that much of a difference between the Oberoi Zahra and Oberoi Philae in Egypt. But when you really take a close look the Zahra is the better ship in the most important ways: It’s newer, the itinerary is better and I did hear that the overall service was better. If you are looking for a large cabin, then you’d probably have to pick the Philae as even the standard cabins are considerably larger (36 square meters compared to 26!). 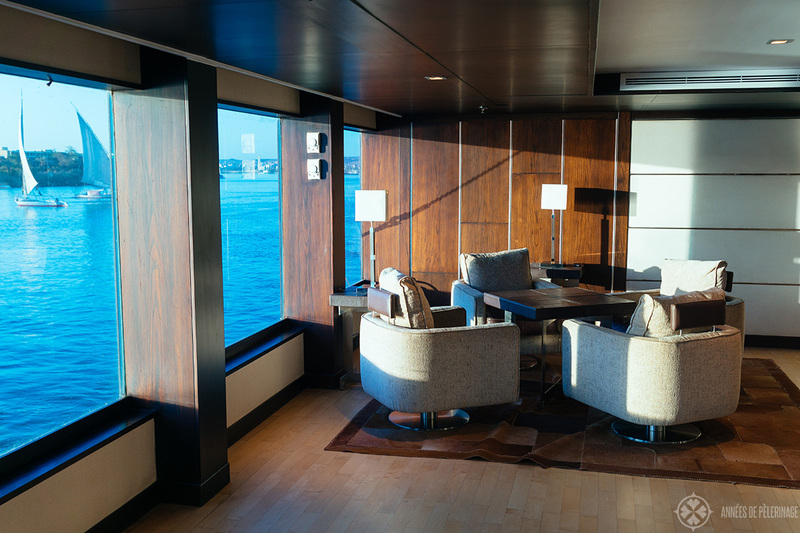 While the standard cabins do not have a balcony, they have large French windows that will convert your room almost into a terrace. (Please be aware that there are a loooot of insects on the Nile and you really can’t open the windows at night). 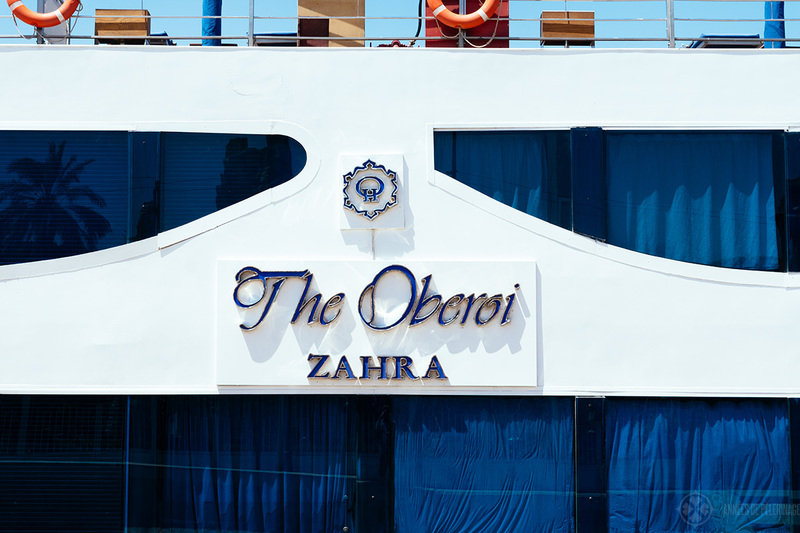 Note: I believe the Oberoi Zahra is currently on its way to the dry dock (as of June 2018). 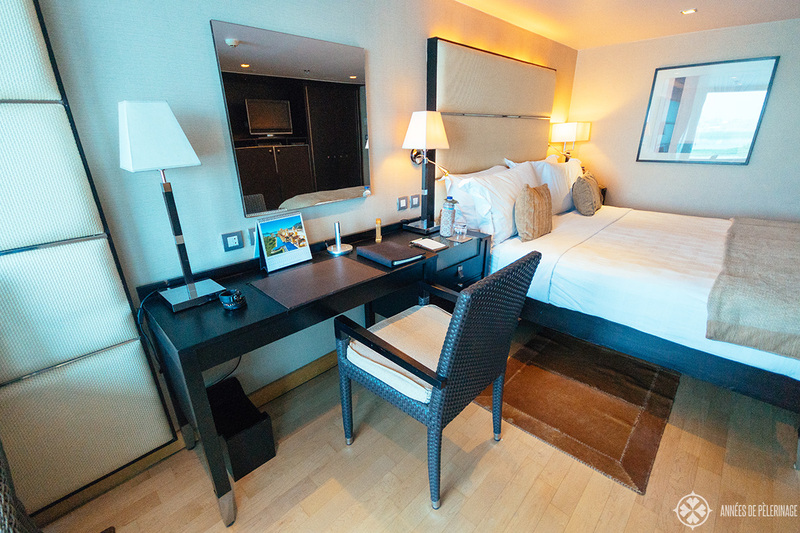 But I’m sure you will enjoy the Oberoi Philae just as much – they are so similar. So, that’s it. This was my Oberoi Zahra review. Hope I could help you with your choice. Got any questions? Feel free to comment below. Oh, and don’t forget to share this article on social media! Thank you for the great review! Is there a blow dryer in the bathroom? of course, there is. Let me know if you need any other information. Thank you Norman for a very useful review. Do you recall the price of cocktails and wine on the ship? I can’t find anything on their web-site, and it doesn’t appear that one can purchase a drinks package in advance. Also, are all of their docks private, or are they jammed in with all of the other Nile cruise boats? There is, as far as I know, no drink package. Coffee, tea, and water is complimentary. Prices for cocktails are around 10 USD and beer is like 3-4 (so a bit on the upper side). Non-alcoholic drinks are fairly cheap and I didn’t find the prices unreasonable. Hi Norman, funny question here. Some of the nile cruisers didn’t allow flushing toiletpaper in the past. Is the Zahra like that? really? never heard of that, at least not in Egypt ( familiar with it from Peru or Central Asia, tho). We are looking at using the Zahra for a Nile cruise in February 2019. I know that the Philae (their “sister” ship was refurbished inside to look like the Zahra. How is the fit and finish in the Zahra since it has not been refurbished? Also was their optional Abu Simbel trip by air or bus? and what was the price? great questions. The Zahra has not been refurbished but is pretty much pristine – it’s the way younger ship anyhow. In terms of style they don’t seem to differ a lot at all, as you mentioned. The price was a bit over 500 USD for two persons. Just wondering about disembarking, are there issues with getting to shore for day excursions since it is a big boat ? I heard you have to climb over a few boats to get to shore? no, Oberoi just uses private docks, so there are no issues with disembarking. If you pick Movenpick or any other cruise liner, this is common practise at the other, shared docks. Thanks so much Norman, for your excellently written review. You provided so many intuitive details that I’ve been went wondering about. My husband and I have booked for end August (I’m hoping it will be a little cooler by then and we’re ending with a stay at Oberoi Hasheesh. Thanks again. Much appreciated. I wanted to stay at the Hasheesh property as well, but it wouldn’t fit into my schedule. BUt my dad was there twice already and loves the poperty! We certainly enjoyed reading your review and plan on going on this Cruise in 2019. One question I have is does this cruise line have a contingency if this ship is out of service on the week it is scheduled to cruise? 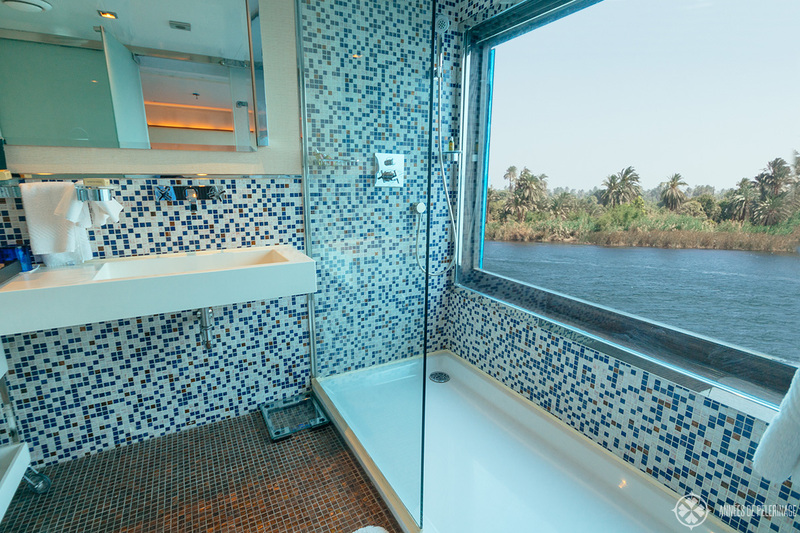 We have occasionally seen a “bait and switch” on some reviews we have read on some of these Nile cruises. Any thoughts or comments on this matter? Ultimately, I cannot answer you this questions and you’d have to ask them yourself. Thanks so much for your thorough review. When I travel I think I will keep your review in mind. Is the live review on YouTube?? This level of attention should be there especially if all 27 rooms/cabins were not filled. This is my Dream for my 50th bday in April2019. This review has made my day. It’s honest and current. When is the boat due to be out of the dry dock? Ps. My issue with the Zahra is that they will not allow us to have 3 persons in a room and it makes the trip over our budget to have 2 cabins. I wish they would change that policy….. The problem is: Three persons simply won’t fit into a room – except a toddler. Hence there really is no way around booking 2 cabins – they may be spacious, but i really wouldn’t know where they could fit in an extra bed. 1. We have been told by 2 travel agents that cabins are assigned at boarding; that you can’t reserve a particular one. True? would hate to pay for luxury and end up near the engines! 2. All 4 of us are wine drinkers. Your review mentioned cocktails but not wine. Is any wine with meals included? Are there wines other than Egyptian wines? I’ve not heard raves about them. Did you go to Cairo and Giza prior or after? Recommendations for hotels and how to book private guides to Giza and sites around Cairo? I really don’t know if you can reserve a certain cabin. I’d send them a message and just ask for it. As for wine – they do have a wine cellar with a selection of international wines. It isn’t filled with the finest Barolos, but it’s quite okay. I did Cairo before the cruise and stayed at the four seasons cairo (Click for prices & more pictures). They offer a wide selection of private tours. in the blog you said Smart Casual was the attire for dinner. Travel agent told us coat & tie for guys. This was not your experience, right? Should the gents take one just in case? You mentioned in the blog that smart casual was the dress for dinner. Our travel agent is telling us coat and tie for the guys. Not your experience I take it! Thank you so much for this amazing review! I found it very helpful. I just booked for September 2019 and the brochure says disembarkation is at 6:30 am. Do you know if it is possible to do it a little earlier in order to catch a 8:55 am flight? Hope you can give me some advise! if I remember correctly, my flight was even earlier. It’s quite possible to disembark earlier. I think I left at 4:30am. Wow! This is an amazing post. This cruise looks so stunning and relaxing. Glad to be of help. I’m sure you will enjoy it! When are you boarding? We board Luxor 12th March. May see you there. Great read Norman. Thanks. Philip, when are you travelling as we embark at Luxor on 12th March? 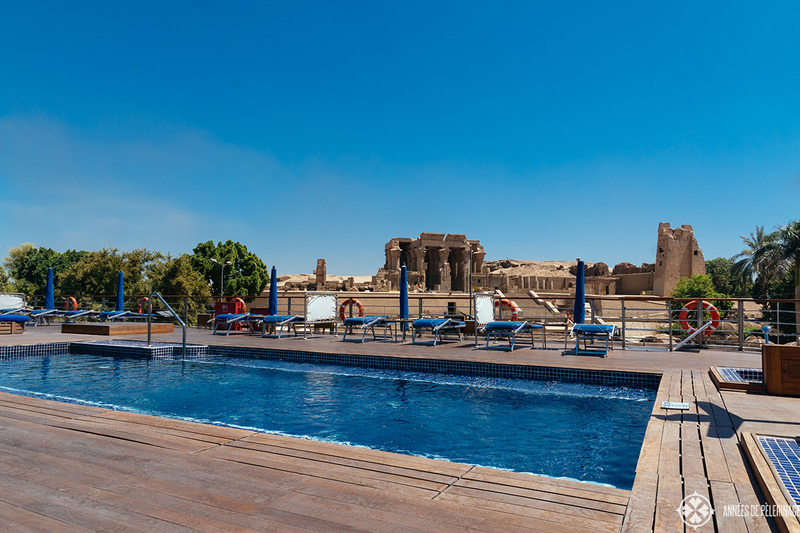 Loved your review of the Nile Cruise and wondered how you booked your trip by air to Abu Simbel? I’m booked on the Zahara for a 7 day cruise in May but they can’t supply any details about this optional tour!